One of the interesting, mostly open aspect, natural community groups of eastern North America are the so-called "alvars" of the Great Lakes region. 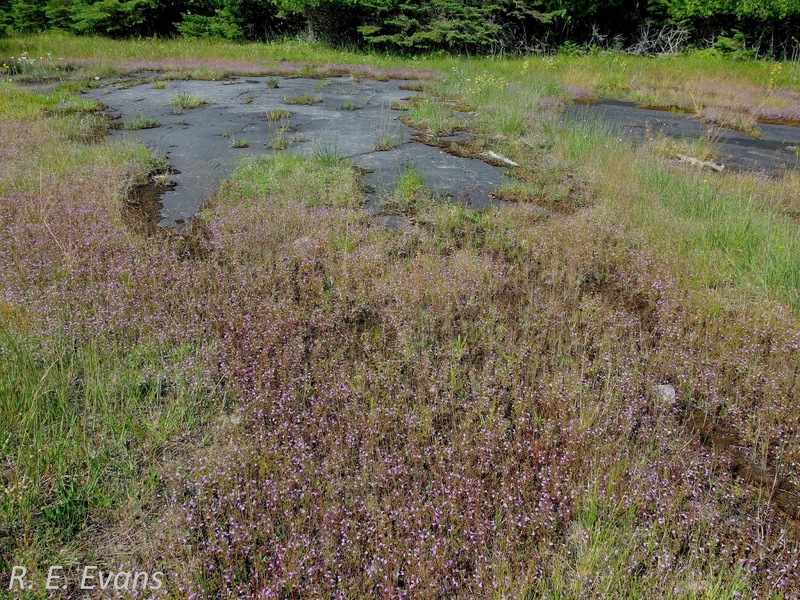 Concentrated in Ontario Canada where these images were taken, alvars include a range of natural communities. 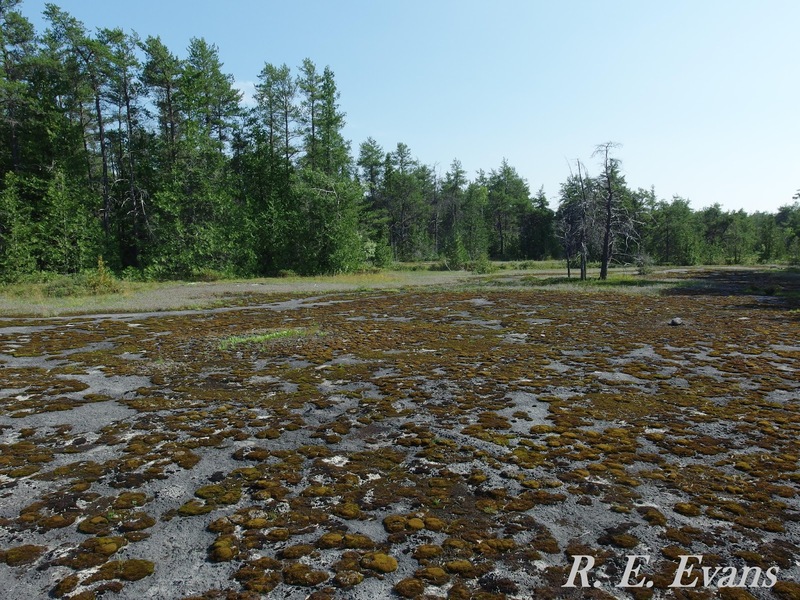 Like many similar habitats in eastern North America they stand in striking contrast to the surrounding, often densely forested landscape. 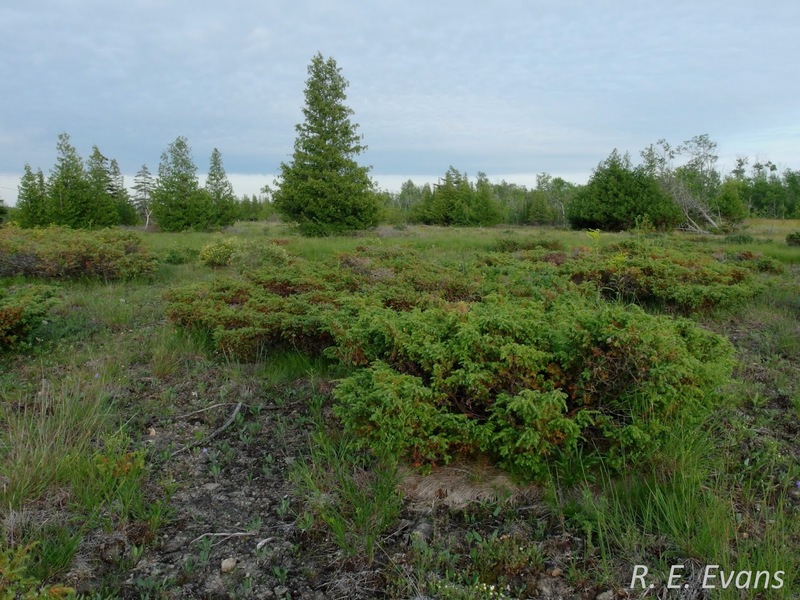 In the image below, these forests consist largely of Jack Pine (Pinus banksiana) and Northern White Cedar (Thuja occidentalis). 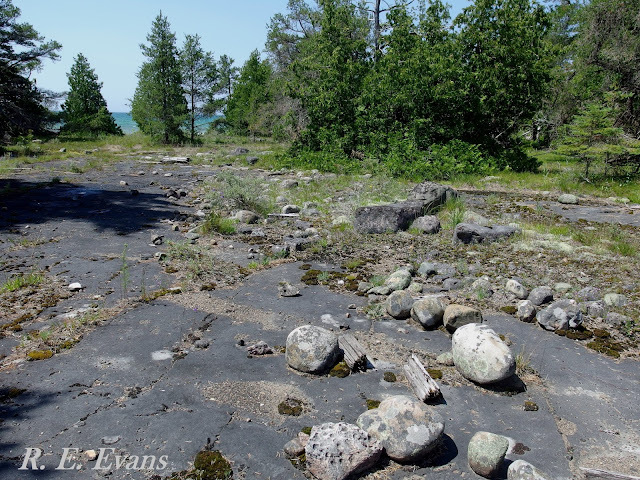 It has been shown that the majority of known alvars occur with approximately 1 km of shorelines (https://archive.epa.gov/solec/web/pdf/alvars_cobble_beaches.pdf). 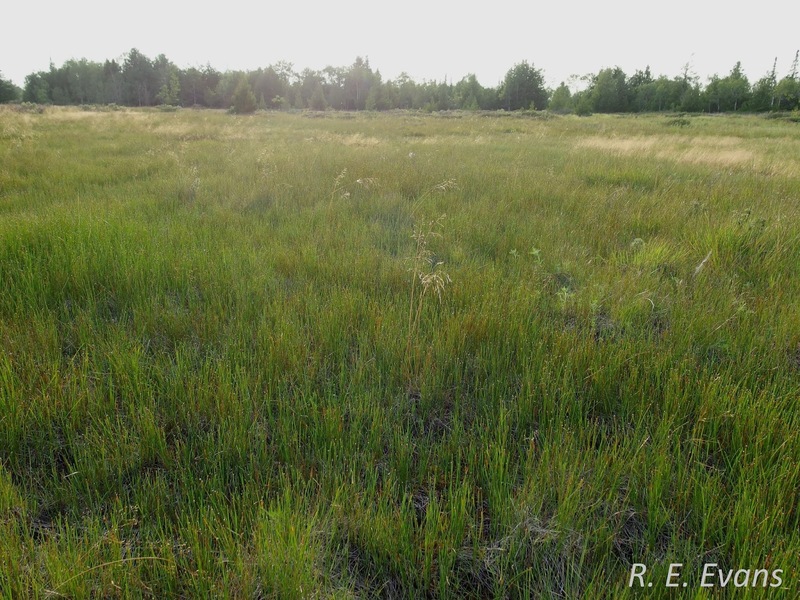 Many authors, especially Catling and Brownell, 1995 and 1999, distinguish shoreline alvars from those occurring in more interior locations. 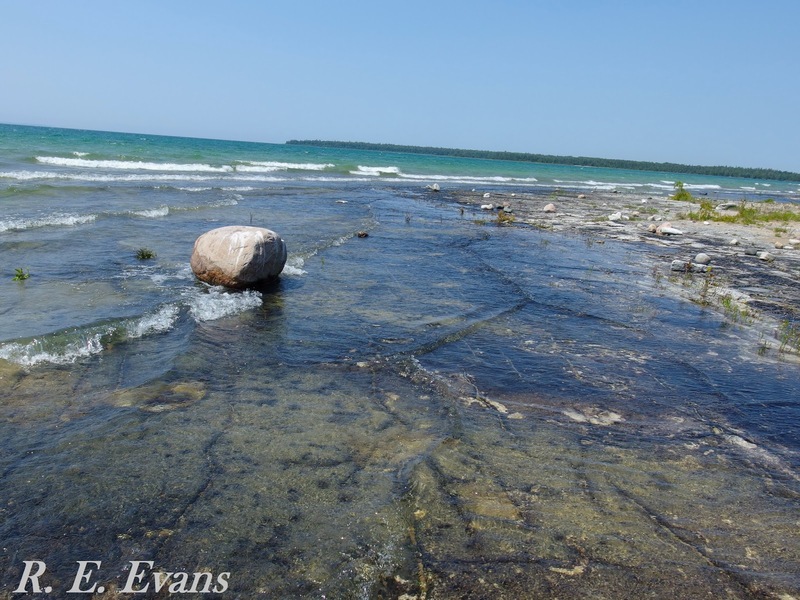 The most notable difference between these is the sparseness of the vegetation on shoreline or coastal examples (see images below). 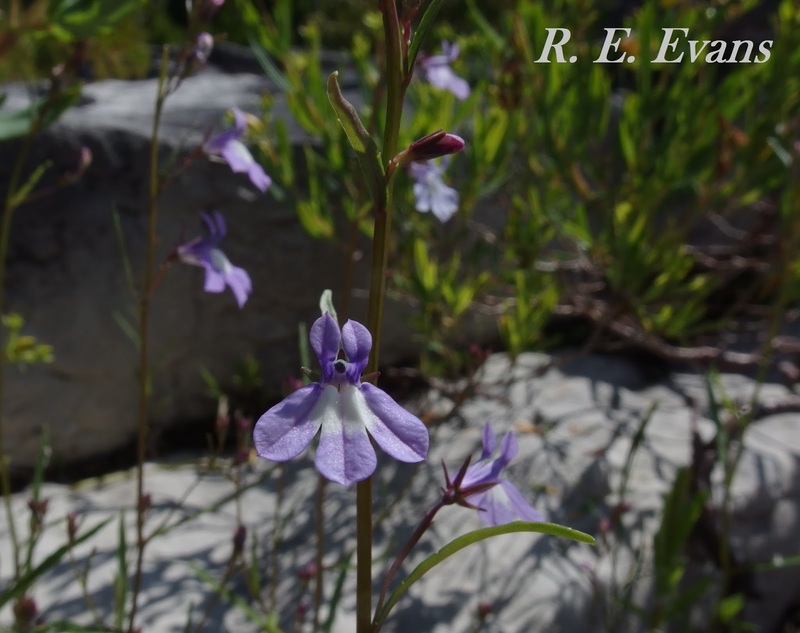 However, Catling and Brownell (1999) also list several plant species indicative of both types. 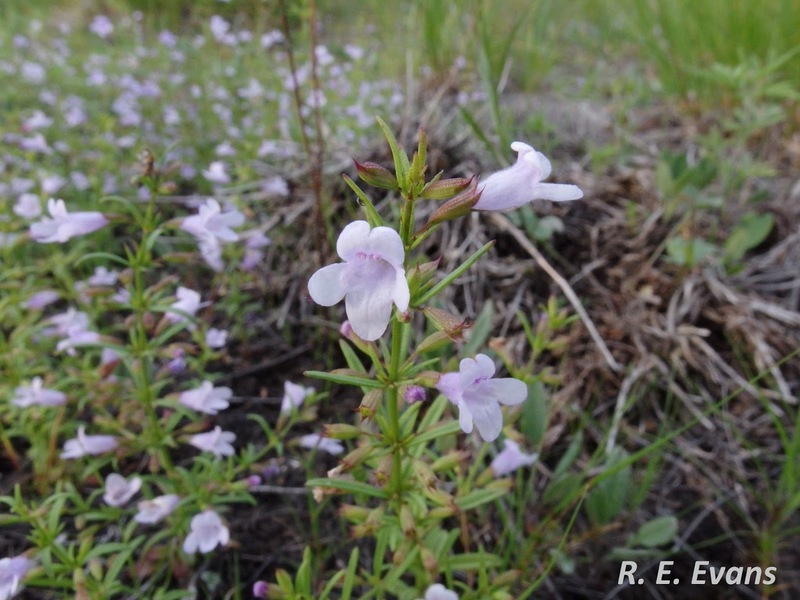 Among their list of species "more or less restricted to shoreline alvars" is Kalm's Lobelia (image, right). Although not included on their list, I noticed fringed gentians (image, below left) only in shoreline alvars as well. All North American alvars are restricted to limestone or dolomite in the Great Lakes region (see map below), stripped of surface material by glaciation action. 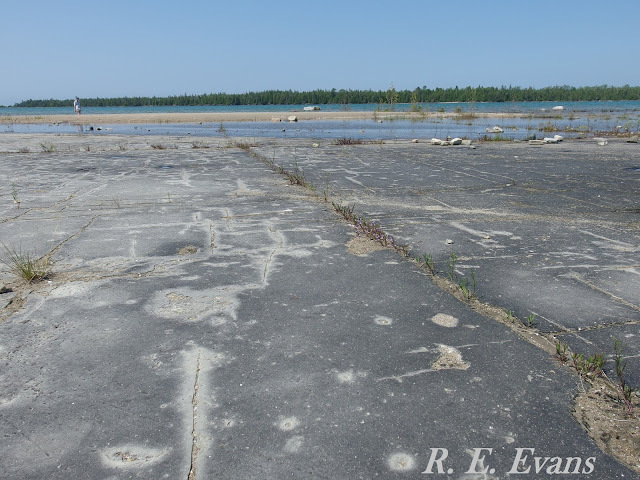 Several examples I observed had glacial erratics present. 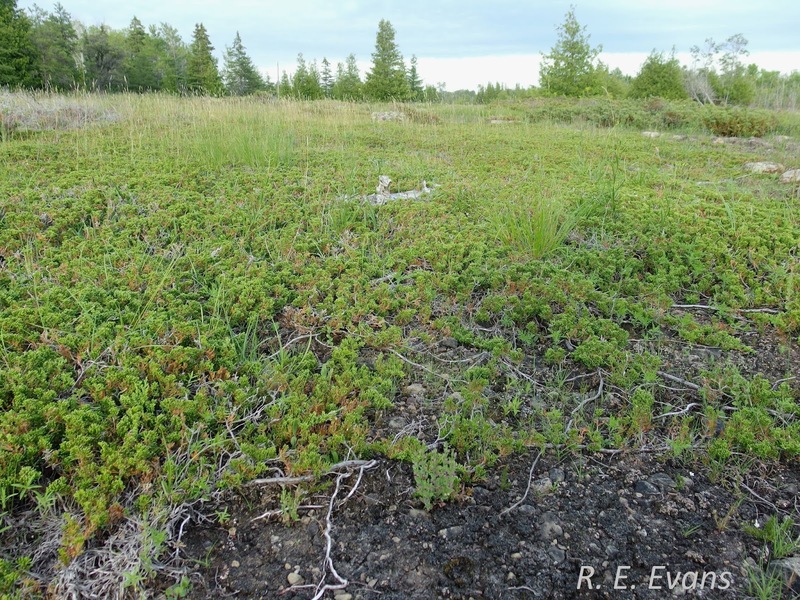 The extent of vegetation cover across alvars is highly variable; NatureServe recognizes at least 13 different natural communities with different structure and composition. 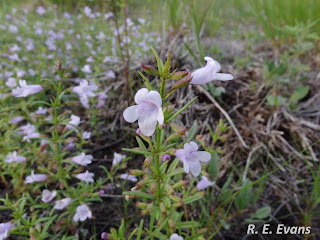 Limestone Calamint, formerly Calamintha arkansana, was considered a dominant species on Lake Huron alvars according to Catling and Brownell (1999). 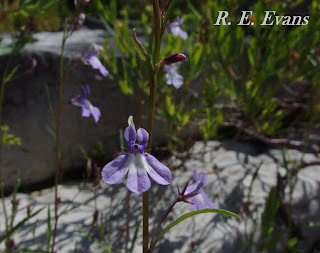 This appeared to be the case in several examples I saw as well especially in very shallow soils around open inland pavements; NatureServe includes it as a nominal in one of their community types as well. 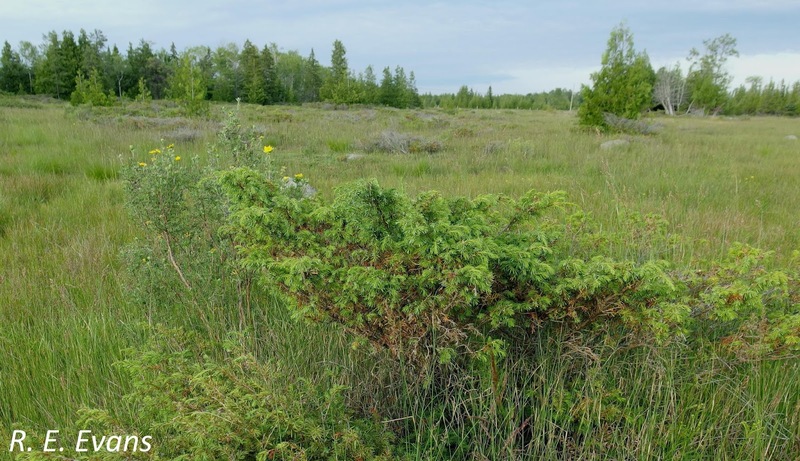 (Juniperus horizontalis) and could perhaps be considered a dwarf shrubland. The second, and perhaps regular 'ole shrubland, has numerous & prominent clumps of Common Juniper (Juniperus communis) with patches of bare soil, grasses, and Shrubby-Cinquefoil (Dasiphora fruticosa). I conclude this entry with a series of images of herbaceous dominated alvars. 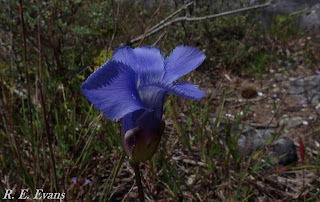 The first was quite moist and dominated by Spikerush (Eleocharis sp. 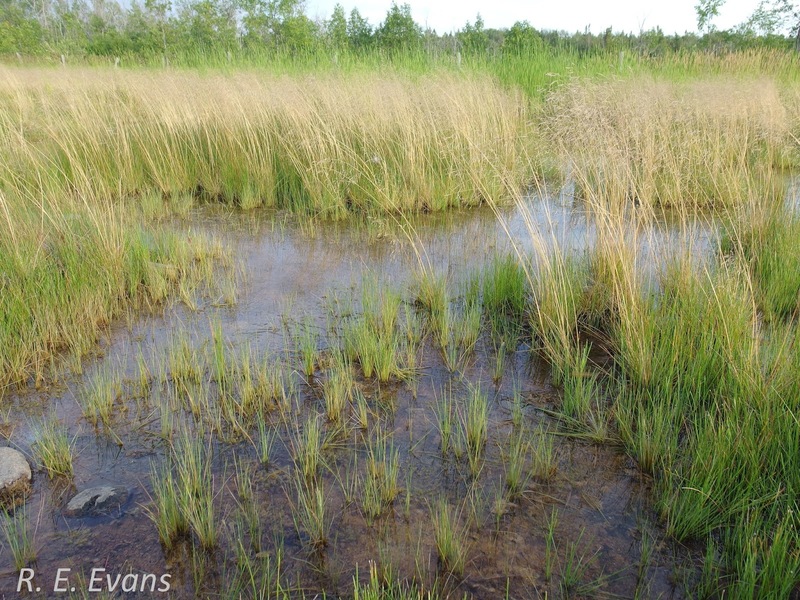 ), the second was even wetter and dominated by what I believe was Tufted Hairgrass (Deschampsia caespitosa). 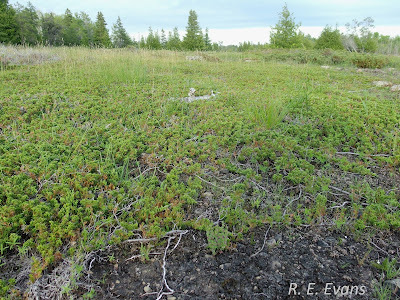 The last, is a dry grassland with emergent Common Juniper and Shrubby-Cinquefoil.